Thanks to PEAC (Programs to Educate All Cyclists), my G is learning to ride a bike at his own pace. I'd given up a weeks ago, introducing the idea every few days, but I didn't have much hope for success. I've tried to get him bicycling time and again, but he always goes for the scooter toys (my nickname for him is Scooter). To motivate him, last year I even let him pick out a brand new bike in his favorite color. The training wheels kept getting wonky, causing him to fall. He had difficulty with the concept of pedalling, doing so backward which of course stopped him. He then had a really hard time getting going, so I'd push-start him every 5 feet. We tried family rides, but I had to abandon my bike to help him out. The other kids would be a block+ ahead - and bless them - they'd wait patiently until I would call out to move on. Impulsivity and distractedness was a problem for G last year. He'd stop and examine every little object of interest. Typical of autism, he was more interested in the parts than the function. He loves to flip it over to spin the wheels, or tooting the horn, and revving the vroom vroom tachometer on the handle. Basically, he wasn't motivated. I never figured out if it was because he couldn't, or just wasn't ready. This year he took an interest in his big bro's Razor scooter, so I gave in and ordered one for him in his favorite color. He rides that around expertly, which I believe has contributed to his confidence. But still, his neon green bike sat waiting. 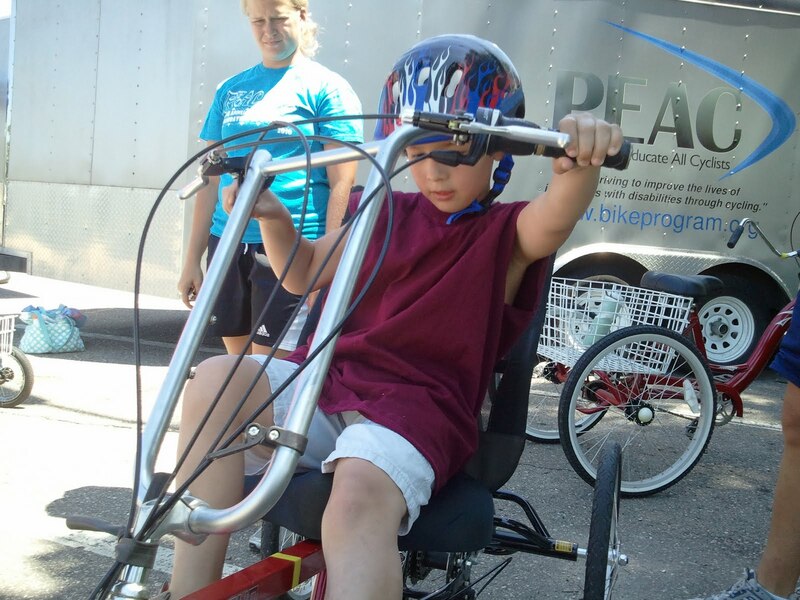 So when I learned about PEAC bike program through a presentation at Autism Collaborative Center, I knew it would be perfect for G. PEAC helps individuals with cognitive, physical, and emotional disabilities reach their cycling goals (and much, much more - follow link). This week was his 1st week of their 7 week summer program, his "Assessment" appointment. 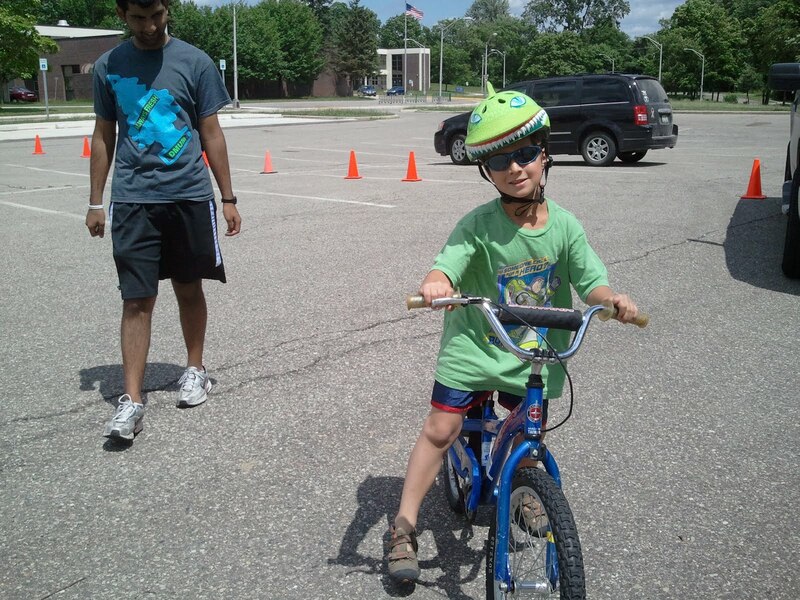 They truly worked with him from the ground up, they work to the child's level and needs, often just putting on a helmet or simply touching the bike is the goal. Their methodology is so cool: with G they started him walking the bike: sitting on the seat, minus pedals, so it was less awkward. Next they had him push off, scoot, push, scoot, etc. I never would have thought to have him practice this way, getting a feel for the bike, balancing skills, and just teaching "where the ground is" helped to take the fear/intimidation factor out. They put the pedals back on the bike when he agreed that he was up for the challenge, ready to ride. The instructor walked/ran next to the bike, holding him to keep him upright and moving. G's balance is terrible, so that guidance is important. At the session's end, he rode about 5 feet on his own! Stopping with handbrakes and making turns are going to be a challenge. Balance and spatial awareness are sadly lacking in him. I'd love to get to the point where we can take a family ride and not have to assist him every step (roll) of the way. 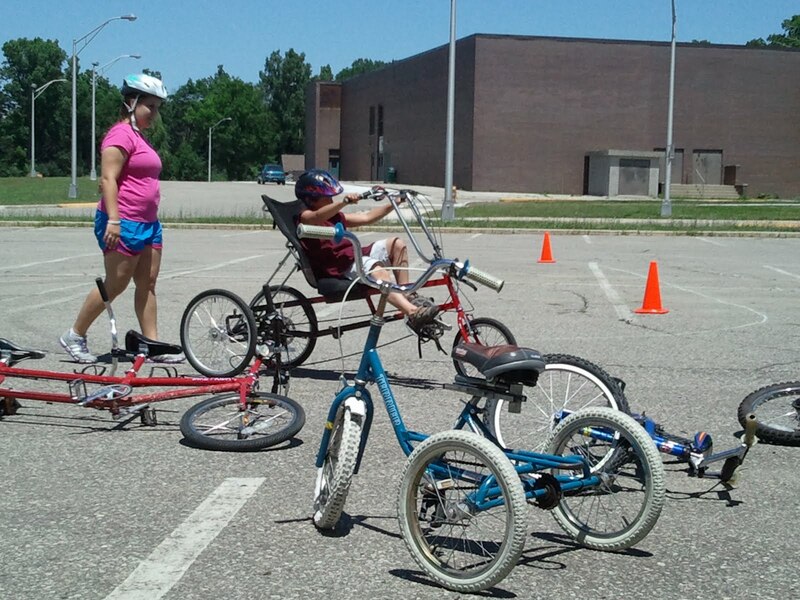 PEAC has many adaptive bike styles for use with students' unique needs. G was curious, they let him explore, try to ride, and explained the bikes to him. The instructors were all respectful, patient, encouraging and it was obvious that they love their work. Many of them are college students who are working towards a therapy or special needs degree, so they're well-versed in various needs, behaviors and best practices. 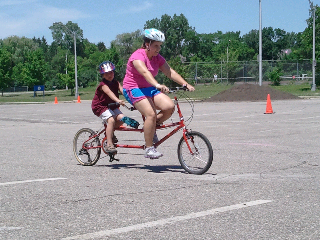 As a treat after working him on the 2-wheeled 20" bike, they took him for a ride on a tandem bike. 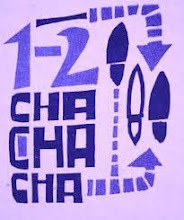 They explained that it teaches pedalling rhythm, balance and the feel of riding well. I hope that this kind of organization is made available everywhere. What a fun, family-oriented, useful skill to teach. Bike riding uses large muscle groups, making it wonderful sensory input. Best part: the feel of the breeze, speed and freedom are exhilarating. I can't wait to join in on a weekly family bike ride with PEAC, and enjoy family bike rides in our neighborhood. This is Chantal, and I'm one of the instructors from PEAC that worked with G this week. This was my first time working with him and it was wonderful! He is one of the most optimistic and motivated kids I've worked with (in AND out of PEAC!). Every time the bike would tip or he would stumble he would instantly say "that's ok!" and hop right back on with out a moment of hesitation. After making our way around the "track" quite a few times he finally did a whole lap all by him self (my hand was on his back but he didn't need it)! He's so close! You're completely right, we'll keep working on turning and stopping but he's already doing so well. If his older siblings work on his skills with him at home let them know to place their hands on his hips as opposed to the seat of the bike because that will help him balance more. If he gets going they can move one hand to his back. Thank you so much for sharing this story on our Facebook page and we're looking forward to a great summer with you and G.
:) Thank you for the feedback too! Thanks for the hints for us when helping him at home. I'll bring my older 2 kids one of these days so they can see what methods you use.